I enjoy food. (Does anyone not?) I think it's likely that food will be a common topic for posts here, particularly since names for food have an interesting way of passing from one language to another. Today we'll start with the Hebrew word for corn, tiras. The grain we call corn was first discovered by Europeans in Central America. So why then do some older translation of the Bible translate dagan as corn? See Genesis 27:28 - "plenty of corn and wine". So now the question remains. Why did the Jews in Europe adopt the term tiras for maize/corn? In the Bible תירס is the name of one of the sons of Japhet. Far and forced is the way in which this proper name came to denote 'maize' or 'corn'. 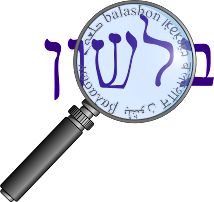 The Talmud renders תירס by בית תרייקי. In the period of the Haskalah (1750-1880) it became customary to identify תרייקי - merely because of the similarity in sound between תרייקי and תורקיה - with Turkey. Furthermore, since maize is called in many languages 'Turkish wheat' (cp. e.g. Ger. turkischer Weizen - whence Yiddish Terkische weiz - It. granturco, Hungarian torokbuza, etc.) תירס was and still is used to denote maize in Hebrew. The identification of תירס with maize on the basis of the above reasoning cannot be accepted. Before all בית תרייקי cannot be identical with Turkey, because the Babylonian Talmud was concluded about the end of the fifth century and the Talmud Yerushalmi, in which תירס is rendered by תרקא, was concluded even earlier, whereas the Turks appear in history for the first time in the thirteenth century. Furthermore, the Biblical name generally used for Turkey is תוגרמה (the modern name is טורקיה). In consideration of all this I suggest to call maize in Hebrew either חטת-טורקיה or חטת-תוגרמה, i.e. 'Turkish wheat', which are a simple loan translation of Ger. turkischer Weizen, etc.